Durango is best known for its free-flowing river, majestic mountains and historical railroad. But besides being a destination city in Southwest Colorado, what do people think of when they hear the name, Durango? Chances are they equate it with tourism, outdoor pursuits and the Old West  many of the things Durango the city has come to represent. And this may be why several companies have taken an interest in the name and applied it to their products. 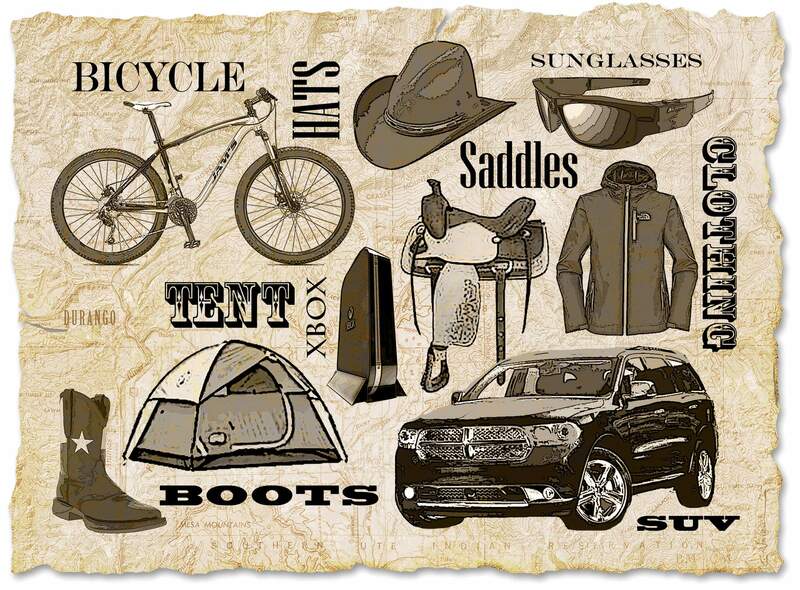 Some of the products include a tent, martini, mountain bike, pair of video-recording sunglasses, a video game console, and, of course, an SUV. So whats in the name? And how did so many companies come to adopt it as their own? Cox said he is a Colorado native and has visited Durango on several occasions. I had to give ode to my home state, he said of the name choice. He also likes the word, Durango. Ellen Hartsfield, who teaches linguistics at Fort Lewis College, said the word comes from a city by the same name in the Basque region of northern Spain. Names dont always have a meaning, she said, and if they do, the meaning can easily become lost. It has been suggested Durango means a meeting place or a place with a river running through it. Names like Durango can evoke certain associations, Hartsfield said. For me, that would probably be adventure, maybe a little bit of the Wild West, fun, skiing  all those outdoor pursuits, she said. It is possible the name appeals to younger generations for its outdoor connotations and older generations for its suggestion of freedom and the Wild West, Hartsfield said. The word is very different than say, Manhattan, she said. Whatever the meaning then, it has taken on its own meaning now, he said. Product naming is big business, and specialized companies put a lot of time and research into finding a marketable brand name. Specific sounds often have similar meanings across various countries and languages. For example, ba tends to be a friendly sound, while ka is a fast sound  fortunate for Camaro and Corvette, Hartsfield said. Durango has the dur sound, as in durability or duration, she said, and it has go, as in go, go, go. A car manufacturer would like these sounds in conveying a product that lasts a long time and works well, she said. I think that would be one of the things that they would have thought of, she said. Perhaps the most widely recognized Durango product is the Dodge Durango, which has been around since 1999. Naming rights for the SUV can be traced back to our city. As the story goes, engineers were test driving the new Dakota in the 1990s. They started in Denver and headed west on Interstate 70 and up the mountain passes to Leadville to test the cars performance and fuel economy at high altitudes, said Patrick Hespen, a spokesman for Dodge, in an email to the Herald. Members on the team commented on the name of existing Dodge trucks  including Ram and Dakota  and noted how they personified the West. Over drinks and dinner, the group began discussing names. Members in the group were searching for places to stay and hit upon Durango, Colo., Hespen said. Durango has played a role in the naming of other products. Coleman, a manufacturer of camping gear, used to make a Durango tent for about $60 but has since discontinued sales. Jamis Bicycles, which has wide distribution in the U.S., has a line of mountain bikes bearing the Durango name. It is an entry-level bike with front suspension, said Russell Zimmerman, owner of Durango Cyclery, 143 E. 13th St., which sells the make. Durango is also renowned for its Western heritage, which might explain the boots, saddle and clothes that incorporate the name. The Durango Ranch Roper Saddle from Royal King is made with real leather and retails for about $600. Durango, a company based in Nelsonville, Ohio, has an entire line of boots  mostly Western-ranch style, but also stylish city and motorcycle boots. Die-hard video gamers are anxiously awaiting the release of a new Xbox, which is a follow-up to the 7-year-old Xbox 360 by Microsoft. The new console has been code named the Durango Xbox 720. The company did not respond to an email seeking comment, and it is unknown if the name will stick once it is released. After a long day, why not relax with a martini? Dos Caminos, a restaurant with locations in New York, New Jersey, Florida and Nevada, offers a Durango martini for $13. The drink includes chili-infused tequila, papaya and agave.